I haven’t seen Dumbo in years, but I still get sad thinking about it. It broke my heart when I was a kid. This elephant with the big ears, stolen from his mom, picked on and forced to perform. Disney used to be dark. I can’t remember if he dropped his feather or was forced to jump without it, but the look of fear on Dumbo’s face sticks with me today. I get it. Dumbo had to believe in himself. He needed to know that his power came from inside him, and he could fly with or without the crutch. The current issue I’m dealing with as a parent is that I’m the crutch. 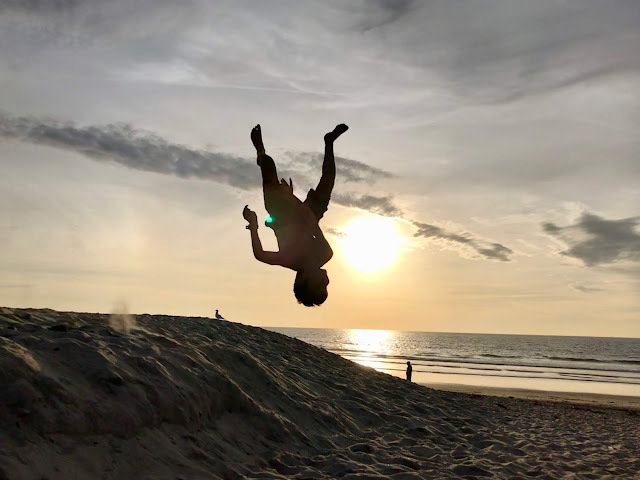 I want my kids to take risks, I want them to climb, to flip, to drop in on the 20-foot halfpipe, or do a backflip off the 10-meter diving board, or even go for the slide tackle that explores the gray area of legality. I want them to fall off the bike and then get back up and try again. I want them to do all of this, and I praise them when they succeed and when they fail, but I still want to be the one to catch them, to spot them, to cheer them on, and occasionally to help them off the field when they hurt themselves. My son has been able to do a backflip for about 5 years. He can do a backflip off the high dive, and he can do one on a skateboard off of a ramp into a foam pit. He can do one on the trampoline too, but he still asked me to spot him. By spotting him, he means me being on the trampoline with him and at the most, barely feeling his shirt glide past my fingertips while he is mid-air. Physically, he didn’t need me to spot him, and I wasn’t spotting him at all. He can also do a front flip 180 and a front flip 360 which is kind of like a vertical and horizontal flip at the same time and looks way harder to do than a backflip. He doesn’t need me to spot him for those tricks or any of the others, but for the backflip, he needed me there. I was his feather. Every time he asked me what trick he should do, I would say backflip. He would ask me to spot him, and I would tell him that he could already do the trick and that he didn’t need me to be on the trampoline with him and that I don’t really spot him anyway, I just stand there looking stupid, and that it would probably be easier for him to do it without me standing there because I take up room on the trampoline and I absorb some of the bounce. I gave him all these arguments, but he would ask until I eventually relented. Last week I came home and my son ran up to me with this big grin on his face. His new trick grin. He asked if I wanted to see his new trick, and I started to head out back to the trampoline and he stopped me and said no, right here. He stood there in the middle of the living room, crouched down and did a complete backflip from standing. I was shocked, amazed, and proud. What about the trampoline? What about the spotting? He showed me how he progressed from doing the backflip on the trampoline to doing it standing on the trampoline without jumping, then doing it on the grass, then the carpet. No spot? No, he said, I did it myself. I was as proud of him as he was for himself, but I felt like a dropped feather twisting its way to the ground.